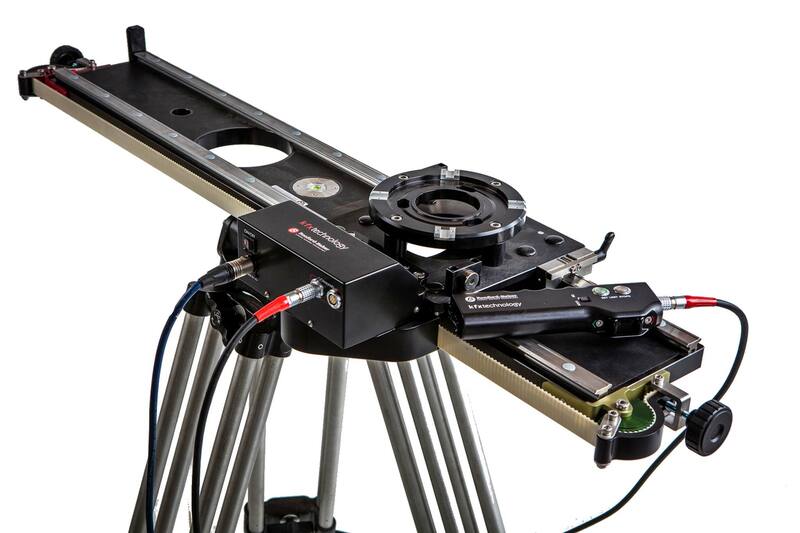 Ronford-Baker will be exhibiting in their own booth (60C) this year at Cine Gear Expo. Atlas 7 Fluid Head is an underslung/overslung modular fluid so-called “nodal” head. It will be shown in 2 Axis and 3 Axis configurations. The photo above shows the Atlas 7 in use on “The Hateful 8” with Quentin Tarantino, and Bob Richardson, ASC. Here’s a video of Jeff Lawrence demonstrating the Atlas 7. This is a heavy-duty fluid head for complete camera systems like ARRI Alexa, RED Epic, Sony F55, Canon C300, Panasonic VariCam 35, etc. Tilt range is +/– 90 degrees, and counterbalance can also go into “free” position. Ronford’s Bazooka Base accommodates Mitchell base heads. It provides an extremely strong and stable platform, with quick set-up and versatile, modular design. It has fixed and adjustable Riser sections. Casters and skate wheels (for track) available. These sliders are available in lengths from 25” to 96”. They have precision-ground stainless steel runners and rollers, 360 degree lockable rotation and adjustable magnetic stops. Mitchell, 150mm or 100mm top fittings, support bars and slider friction units also available. They will also have their new Motorised version of the Slider at the stand. New software has just been launched allowing programmable moves and time lapse functions.